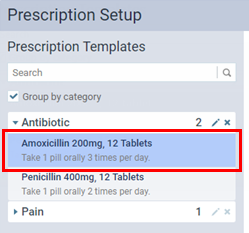 You can edit a prescription template at any time. This does not affect prescriptions already entered for patients. 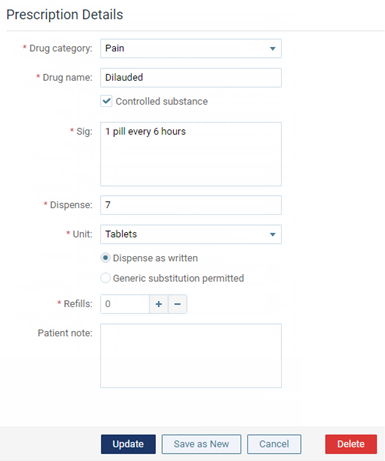 Modify the prescription details, such as the name and dosing instructions, as needed. 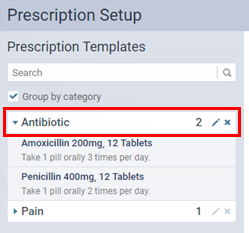 Drug category - Select a category for the drug; or, if the category that you want to use does not already exist, click (or tap) Create a new category in the list to enter a new category (for example, "Pain"). Dispense - Type the amount to dispense (for example, "6"). Also, select the unit type; or, if the type you want to use does not already exist, click (or tap) Add new unit on the list to enter a new type (for example, "Capsule"). To create a new template, preserving the original, click (or tap) Save as New. To apply the changes to the template, overwriting the original, click (or tap) Update. 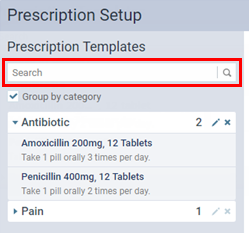 In order for the DEA number to show up on prescriptions the Controlled Substance check box must be selected in the prescription template.